This was a drain in the street in front of 53 Greene St., New York. 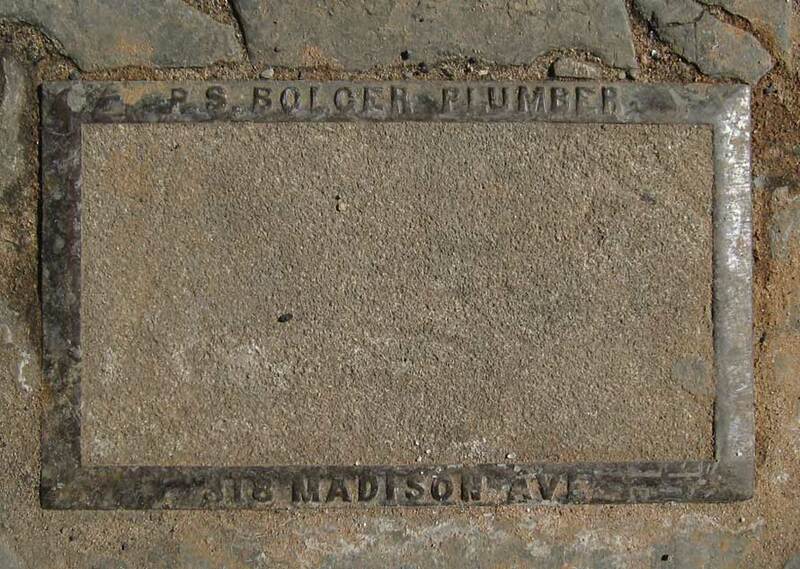 Although filled in with cement, as of March, 2009, it still carried the name of P. S. Bolger, a plumbing contractor at 318 Madison Ave. (near 42nd St.). P. S. Bolger was Paul Samuel Bolger (1848-1927). Born in Milwaukee, Wisconsin, 19 May 1848, Bolger opened a plumbing business in New York in the late 1870s. He married Anna Agnes Hearn (1857-1927) in New York 11 Jan. 1883, and by the time of the U. S. Census in 1900 the couple had seven children and lived at 38 Sunnyside Drive, Yonkers, N. Y. The plumbing business was located at 472 Fourth Ave. from approximately 1881 to 1886. This ad dates from 1885. In 1886 the business moved to 318 Madison Ave., then relocated in 1894 to 708 Lexington Ave. (near 57th St.). In 1905 the New York Times (14 July 1905, p. 12) reported that Paul S. Bolger had bought the 5-story apartment house at 666 Lexington Ave. Bolger moved his business there and stayed at this address until 1926. After Paul S. Bolger's death, it appears that his son, Philip Henry Bolger (1897-1931), took over the business. Philip Bolger's death notice in the New York Times (3 March 1931, p. 36) reads, "Philip H. Bolger, president of the Paul S. Bolger Company, plumbers and steamfitters at 640 Lexington Avenue, New York City, died here [Chappaqua, N. Y.] Saturday at the age of 33 years." After Philip Bolger's death, the business closed. "Washington, May 28 - After an absence from his home of more than six months, during which time his gray-haired father sought him in all parts of the world, Walter F. Bolger, eighteen years of age, who resides in Yonkers, N. Y., has been located and taken in hand by his parents. Paul S. Bolger, the father, found the youth aboard the United States training ship Franklin, lying in Hampton Roads. Young Bolger enlisted in the navy under a false name. "Young Bolger left his home in Yonkers on Nov. 19 last, ostensibly to go to a dentist's. Nothing more was heard from him until yesterday. Foreign Consuls were appealed to, and only a few days before the disaster at Martinique, Mr. Bolger received a letter from Consul Prentis, who afterward lost his life during the St. Pierre disaster, stating that he would do all in his power to aid in locating the boy should he appear in that part of the country. "About a week ago Mr. Bolger was in the Grand Central Station in New York City, when he encountered a soldier, with whom he talked regarding his boy. The soldier, it is said, informed Mr. Bolger as to the manner in which the record of recruits in both army and navy is kept. "The father came to this city several days ago and had a talk with Mr. Darling, Assistant Secretary of the Navy. At the latter's suggestion, a search of the records was made, and the father identified the handwriting of his son attached to his enlistment papers. "Discussing his future plans, Mr. Bolger said: 'I secured Walter a seven days' furlough, and will take him back home to see his mother. I have not yet made any arrangements looking toward my boy's release from the navy. It is for him to decide.'" Another Bolger sidewalk opening is found on Warren St. in front of 56-58 Warren St.